It is advantageous at any level of baseball for a hitter to force a pitcher to throw more pitches to them during an at-bat. The advantages are plentiful: with more pitches, the hitter increases their odds of seeing a pitch in the strike zone, it increases the pitcher’s workload, and it increases the odds that a pitcher will make a mistake via either sheer numbers or fatigue. While Werth put up many impressive numbers as a Phillie, his most impressive may be his pitches seen per plate appearance. In 2008, Werth averaged 4.51 per plate appearance in the heavier half of a platoon with Geoff Jenkins that would have led the league had he had enough plate appearances to qualify. Werth led the league in 2009 and 2010 with 4.50 and 4.37 pitches per plate appearance seen respectively. Despite a declining triple slash line, Werth is 3rd in the NL in 2011 as of June 13, 2011 with 4.27 pitches per plate appearance seen. Werth’s breakout season of 2009 saw the Phillies’ score the 2nd most runs per game out of their four playoff seasons. 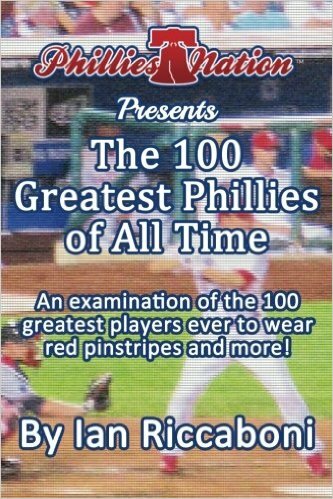 In 2007, the highest scoring for any Phillies’ playoff team for the last four years, the Phillies had Pat Burrell and Ryan Howard, respectively, at second and third in the NL in pitches seen, with Chase Utley ranking 22nd and Jimmy Rollins 32nd. There is a direct value in seeing pitches per at-bat, too. At least it seems that way with this group of Phillies. The Phillies ratio of average pitches seen per plate appearances by regulars compared to their runs scored per game indicates that pitches seen per at-bat become significantly more valuable as your offense output decreases. The graph below illustrates that the Phillies have increased their runs per pitches seen per plate appearance in three out of the last four opportunities, season to season, implying that they have capitalized on pitch counts. Click on the thumbnail for a full-sized graph. 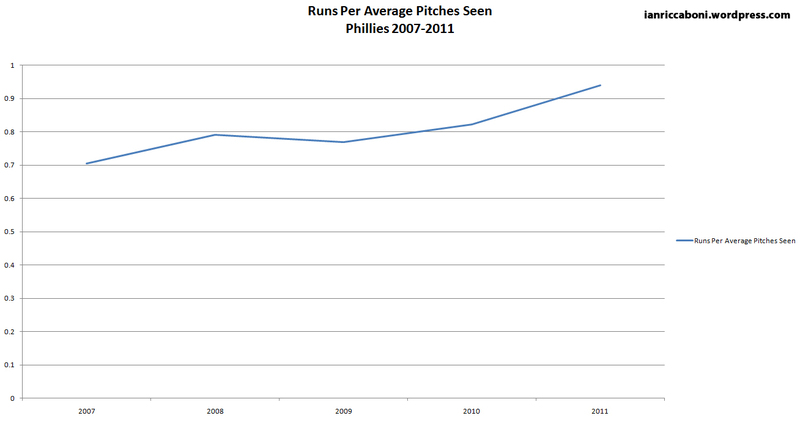 Through this, the Phillies have done more by seeing less over the last few seasons. The graph below illustrates the pitches seen per AB of each of the regulars from 2007-2011. Click on the thumbnail for a full-sized graph. Admittedly, the graph assumes a lot. It gives Wes Helms the nod at 3rd base for the 2007 season because he had more PA’s there than Abraham Nunez. It assumes Shane Victorino was the every day right fielder for the 2007 Phillies despite them having a revolving door there for a large portion of the season. Werth gets the 2008 nod in RF because of him out PA’ing Jenkins in RF; same thing for Chooch and his back-ups in 2007 and 2008. The model is slightly statistically flawed, too; the averages are based on averages of an ideal line-up based on the players featured. You’d be surprised how hard it is to find team information on pitches seen per plate appearance, even just averages. It does not quite exist in its desired form and unfortunately, I don’t have the time to come through one thousand-plus game logs. The team average for pitches seen rose each year, from 2007-2010, likely due to strong performances by Howard and Burrell, the emergence of Werth, and the development of Ruiz and Victorino. Werth’s departure created a .44 pitch per at-bat differential in RF for the Phillies; .50 if you consider 2010 Werth v. 2011 Brown. The difference in average per player is .09375 pitches; double the gap created by Werth when comparing his 2011 to Brown’s 2011. While Werth is easiest to explain away the drop-off, it still barely off-sets the gains made by Howard, Rollins, and Victorino this season. Carlos Ruiz is the other culprit in pitches seen per AB dropping, with his .44 pitches per at-bat decrease matching the 2011 gap between Werth and Brown. Ruiz’s supporting cast features drops by Raul Ibanez (.19) and Chase Utley (.06). If anyone has full season pitches per PA data available and/or would like to help me extrapolate numbers by multiplying them out and finding true averages, I would love to see them and would love the help. Werth’s departure and Ruiz’s regression in P/PA indicate the Phillies’ are scoring more runs on less pitches, but also indicate that if they were seeing more pitches, they would likely score more runs.